We're proud to be a part of this event at the Court Theatre (and encouraged by their desire to be a part of the performance poetry movement in Christchurch). Below is a letter from Philip Aldridge and Dan Pengelly of the Court Theatre explaining a little more about the event this week. We would like to invite you along to an intimate afternoon of poetry at The Court Theatre. 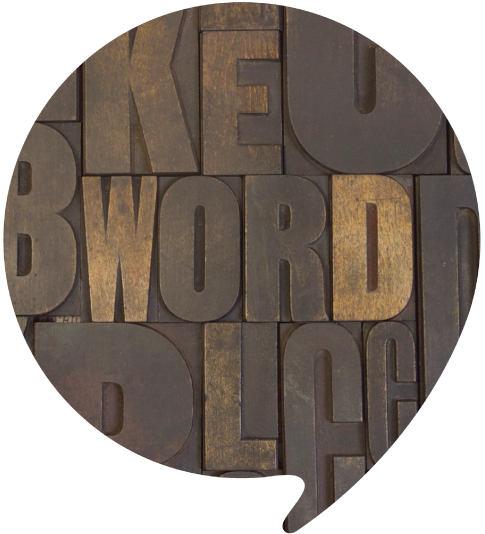 This is the first Forge foray into poetry and we hope to make an annual event exploring words, voice and the world around us. 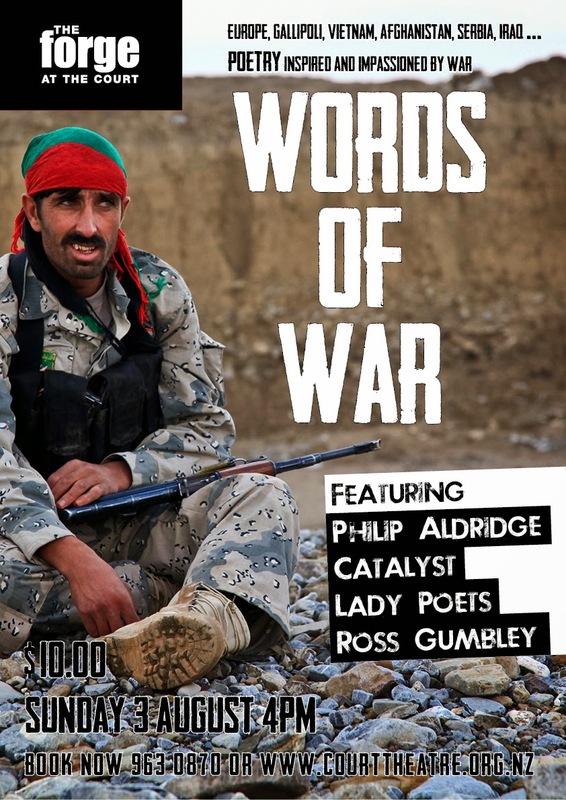 Featuring poets from Christchurch’s professional poetry collectives Catalyst and Lady Poets as well as our very own Ross Gumbley and Philip Aldridge. Europe, Gallipoli, Vietnam, Afghanistan, Serbia and Iraq… Poetry inspired and impassioned by WAR. On Sunday two spaces will hold words, voices and stories inspired and impassioned by War. The afternoon starts at 4pm with music by Amy Grace. Two 40 minute sessions of poetry will take place in The Pub Charity Studio and The Chapman Tripp Stage. From raw and fresh verses of Tusiata Avia to the beautiful crafted words of Kipling, there will be something for everyone. This is a Forge at The Court event. Not sure what that means? The Forge is our boutique theatre brand that goes alongside The Court Theatre main season. Offering intimate and creative theatre experiences for Canterbury audiences. This is our playground for innovation and things that are a little bit different. Wow! Has two years gone by already? It's that time again, when the Writers Festival hits town and this time it's got a brand new look and is more ambitious than ever - 68 events over 5 days. 2014 also sees a much bigger spotlight on poetry and we are proud to be presenting not one but two shows this year. Saturday 30 August - 9pm - The Darkroom - Free entry! Yep, we're bringing back the popular poetical, musical road trip especially for the WORD Christchurch 2014 festival. Featuring some of the stand-out performance poets from our 2013 slow tour of the city suburbs and one special guest, reunited with Doc Drumheller on guitar, the original seven Road Shows showcased some amazing performance poets in celebration of ten years of Catalyst journals and open mics. The 2013 shows came with seven limited edition chapbooks (collector's items now!) 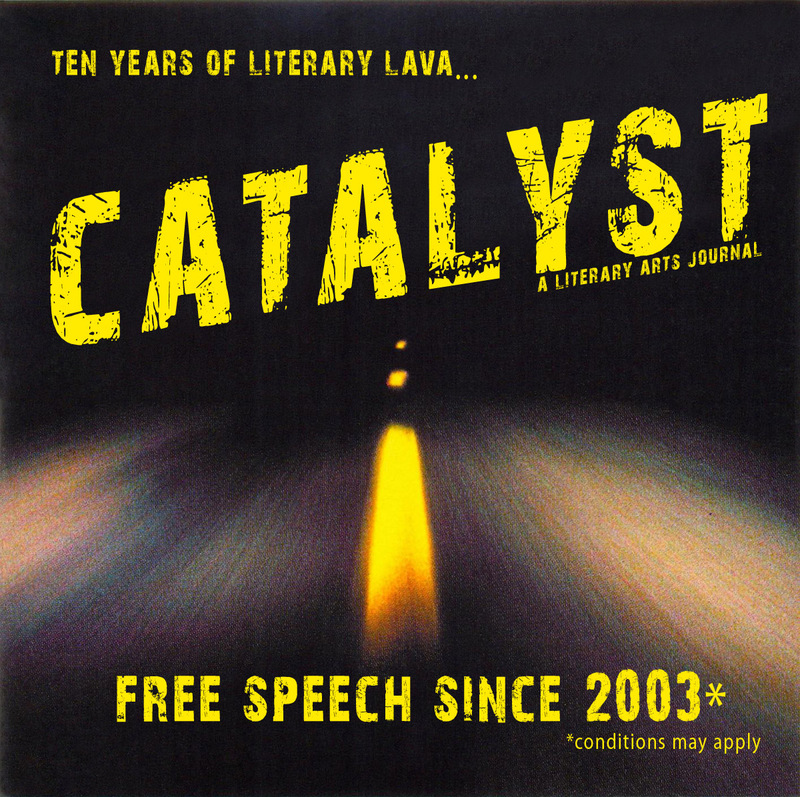 and culminated with the launch of Catalyst volume 10. Now this special one-off Road Show brings to festival audiences a taste of this multi-collaboration, song and poem experience and launches the 11th volume of Catalyst 'My Republic'. Featured poets: Andy Coyle; Ben Brown; Ciaran Fox; Kimberley Holmes and special Auckland guest Grace Taylor of Rising Voices fame accompanied by Doc Drumheller on guitar and songs. Yep that's right, it's the return of the infamous, cut-throat and downright unfair performance poetry competition. Stranded before a live audience, 10 poets have only their guts and wits to see them through a series of challenging rounds of poetical mayhem - only to have to run the gauntlet of Tribal Council. Who will outlast them all to become our third ever 'Survivor Poet'? 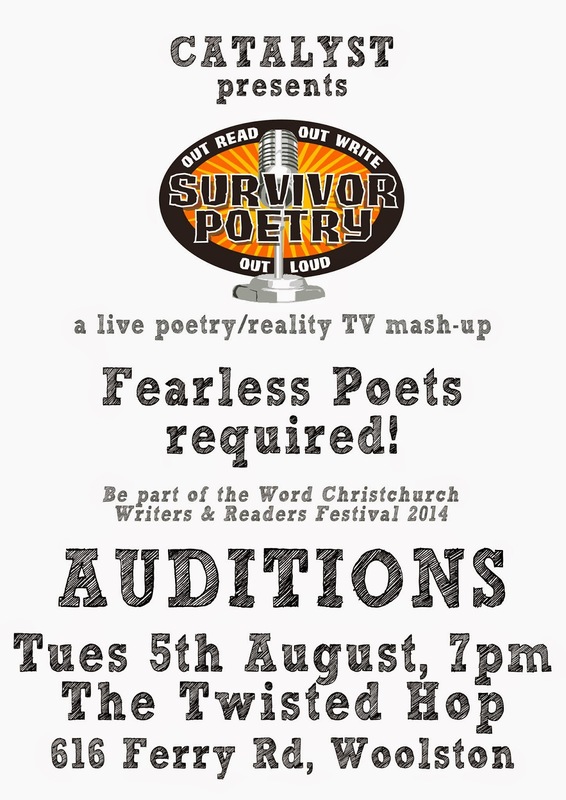 So we're looking for fearless (or foolhardy) poets to be our castaways - auditions will be held at our next open mic on the 5th August - 7pm at the Twisted Hop in Woolston. We'll put up a separate post about this to remind you. Come on, you know you want to!